This page contains release notes from December 2018 and older. Looking for something more recent? Here's the guide for the newer versions of Showbie. In Showbie 4.1, uploading differentiated content is now easier than ever! With the new update, you can select which students have access to your file uploads. Check out this updated guide to learn more! You get an assignment! You get an assignment! Everyone gets an assignment...not! Differentiated distribution is now available for all users! Are you red-dy for it? Users without an avatar photo will have a colourful placeholder image that contains their initials. Bug fix Voice notes now record properly in iPhones. Bug fix Timestamps for pinned comments and text boxes on a document will only update if content has changed, and not if it's moved around. Bug fix Revising a grade will now move the grade bubble up in the post listing and update the modified timestamp. Bug fix Deleting a class folder no longer brings up an error message. Adjustments made to the support widget within the app. Bug Fix Adding text on a file while zoomed in no longer causes the app to crash. Bug Fix Timestamps on file annotations now show when it was created rather than when it was modified. Bug Fix Dragging and dropping files to upload to Showbie while in split screen now works properly. Nobody can read that fast The alert message that a file is too large to upload remains in place and no longer gets dismissed automatically and instantly. Several bug fixes and other enhancements - this time Showbie is perfect. NEW! Improved notifications so that you can reply to posts directly from the notification without having to open the Showbie app! NEW! Active Pro teachers will be prompted to rate the app. Please leave us your feedback! NEW! A "Cancel Request" button is now available for co-teachers if they no longer wish to join a class. Bug fix Fixed a crash that was caused by having pinned comments in a multi-page document. Bug fix Students belonging to a Pro class are able to upload files larger than 25MB. Bug fix Fixed a crash when adding/revising a grade in the document previewer. Several other bug fixes and improvements are included in this release - stay updated to ensure things are running smoothly! An original is worth more than a copy - Fixed an occasional crash after copying an assignment. Version 4.0 (and later) is only compatible with iOS 10 (or later) devices. If you have an iOS 9 device, you won't be able to download the later version. You'll only be able to download version 3.8.x. NEW! Class Folders is now available for iPad users! NEW! Organize your assignments quickly through bulk actions. We fixed lots of bugs too; Showbie is perfect. Fixed an issue where the app crashes when unblocking a parent. Fixed a bug where comments get uploaded multiple times. Fixed an issue where some users can't login and class codes aren't working. Fixed a bug where some users can't unblock class members. Version 3.8.1 is the latest version that will be supported by iOS 9 (bug fixes and improvements will be released version 3.8.x). Future releases from this version onward will only be supported by iOS 10 or later. Please update if you can so you can use the new features in store for Showbie! You can now rename files as you upload them to Showbie from another app. New and Improved - The voice note recorder has been updated! It now includes a rewind, pause, and fast forward button. Pinned voice notes can also be minimized so it blocks less content on a document. Check out our updated support guide! Profile pictures no longer need to be uploaded twice for the changes to take effect. Our policies aren't the only ones we updated - The term "Unarchive" has been updated to "Restore" when you're unarchiving a class or assignment. You can now rename files before uploading when exporting from another app. Fixed a bug where assignments would open twice when trying to copy a file into an assignment. Books with moving pictures - Fixed a bug where opening an ePub file with a video embedded in it would result in a crash. No more doubling up - Fixed a bug where opening and then closing an embedded link in a file would close the document viewer as well. Balance is restored - Posts while in 24-Hour time format is now properly timestamped in Asian languages. Many improvements and other bug fixes. NEW! The highlighter tool is now available for iPad users! Slow motion videos that are uploaded to Showbie now retains the slow motion (no longer uploads at regular speed). Assignment and class names don't truncate anymore in the "All Assignments" tab for students. Cancelling the upload of a video no longer crashes the app. Editing a long comment no longer scrolls to the bottom while editing at the top of the comment. Showbie now follows the system settings for 12-hour and 24-hour clocks. PDF files with a large number of embedded ink annotations load faster. Fixed a bug where pinned comments and voice notes can't be created while zoomed in. Google Drive files can be uploaded to Showbie more reliably instead of just sharing the links. NEW! The Co-teaching feature is available for free, verified teachers. Learn more about how to get setup here! Fixed an issue with the voiceover accessibility tool not working when the audio recorder is displayed. Fixed a bug where the annotation toolbar would be visible even if the user doesn't have permission to annotate on the file. Fixed an issue where pinned voice notes would keep playing after closing the file previewer. Fixed an issue where the file previewer would zoom randomly while the pen annotation tool is selected. NEW! Ability to sort shared folder posts. NEW! New pen and text colours and an updated text swatch in the annotation tool. Bug Fix – Clearing the text field when renaming a file/voice note no longer causes them to fail to load. Bug Fix – Fixed an issue that could cause some documents to fail to load with a “Corruption Detected” error message. Bug Fix – Copy and Layer buttons no longer displayed off the right side of the screen on the annotation tool on iOS 9. NEW! Photo editor now fully supports iPhone X. More bug fixes and minor enhancements. Lots of bug fixes, crash fixes, and small improvements. Fixed a bug that could cause a crash when adding multiple pinned voice notes to a page. NEW! For iPads running iOS 11, you can now drag and drop files and text into a student folder, class discussion, or group post listing to quickly and easily add content from other applications. NEW! Introducing EngageNY Activities in Showbie! Now you can find and assign Common Core math and english language arts activities to your students without leaving the app. NEW! You can now copy documents between assignments, discussions, and groups, including Showbie annotations. NEW! Documents with Showbie annotations can now be exported to other apps as regular PDF files. NEW! Teachers and students in Norway can now use their Feide credentials to sign in to Showbie. Ask your administrator to enable this feature at your school. Licensing Changes – All annotation tools, locked and view-only assignment modes, and assignment schedules are now available in the free version of Showbie. Licensing Changes – Teachers using the free version of Showbie are now limited to the use of 10 active assignments at a time, and assignments expire one year after their creation date. Licensing Changes – Showbie Pro has a new, lower price for back-to-school! Fixed a bug causing Showbie to crash while erasing annotations, plus other improvements. Timestamps on post listings auto update (eg. Just Now –> 1 Minute Ago). Links on pinned comments are tappable. New help menu that includes the app version number. The version number has been removed from Settings. Pen settings no longer have the defaults based on shared folder, student folder, etc. The default pen setting is black, medium width. If a user changes their setting it becomes the new default. Tapping a group link within the app takes you into the join group flow. Better live update integration on the assignment side with indicators, etc. More fixes to come! Some pro users were unable to record long pinned voice notes. Empty top level lists are no longer empty. Set Assignments to “View-Only”Set assignments to be “view-only” so that students can review work, feedback and grades, without allowing them to revise their work. Create Assignment SchedulesPre-schedule assignments to automatically become locked, view-only, or editable at a future date and time. Great for in-class quizzes, projects with strict deadlines, or lining up future assignments in advance! Fine-Tune Your NotificationsWe’ve added the ability to separately enable or disable each individual notification that Showbie sends, including separate control over push and email notifications. So you can now choose how Showbie communicates with you, based on your preference. Rename Your Voice NotesYou can now give a descriptive title to voice notes after adding them to an assignment folder, group, or class discussion.Improved GarageBand CompatibilityShowbie has increased integration with GarageBand by allowing users to import and export GarageBand audio files and project files. 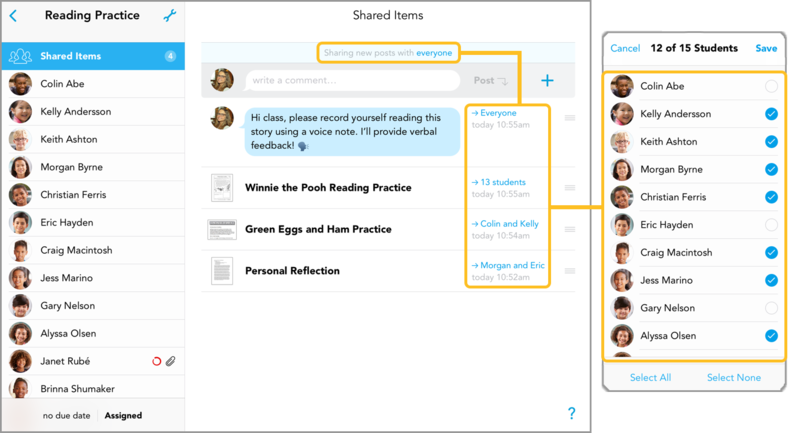 Package edition updatesClass Discussion and Group communication features have been moved to the Classroom Pro Edition and School & District Editions of Showbie. Parent Access and Portfolio are now part of the Classroom Pro Edition and School & District Editions of Showbie. dUpdates to our packages will only affect new teacher accounts and teachers who are not using the Classroom Pro Edition and School & District Editions of Showbie. Teachers using the Basic Edition of Showbie who have been using features involved in the package edition updates, with the exception of Portfolio, will be able to continue using these features until July 30, 2017. Bug fixes and iOS 10 compatibility. Every Showbie class now includes a class discussion, where students can ask questions, chat about projects, and share their work. Teachers can easily moderate the discussion by pausing/unpausing student posts with a single tap. In groups and class discussions, new posts and updates will automatically flow into the app in realtime, allowing for instant feedback and fluid conversations. Showbie push notifications are now surfaced in the app while you’re using it, so you can easily stay on top of conversations and updates happening in multiple classes or groups at once. You can now type a comment directly into a group or folder with a faster and more streamlined interface. Showbie’s photo picker is now compatible with iCloud Photo Library. Showbie Groups are here! Create a group and invite any combination of your fellow teachers, students, and parents to join. Use a group to share resources with your department staff, have a class discussion with your students, or coordinate with parents for extra-curricular activities. We can’t wait to see how you’ll put this feature to use! Showbie is ready for iOS 9 Split View multitasking! If you have an iPad Air 2, iPad Mini 4, or iPad Pro, you can now use Showbie and another app simultaneously alongside one another. Showbie is ready for iPad Pro! Assignments, documents, and annotations have been optimized to make best use of the iPad Pro’s big, beautiful screen. Showbie is optimized for Apple Pencil! With amazing resolution and perfect palm-rejection, Showbie + Apple Pencil make feedback annotations on student work feel totally natural and more accurate than ever before. We’ve adjusted the “Allow Parent Access” setting to be turned off by default when creating a new class as a Showbie Pro teacher. Parents can now join Showbie! As a teacher, you can easily invite parents to join their students by sharing a unique parent code. Showbie will even create a batch of printable handouts to send home with your students, making it easy to get parents on board. Once a parent signs up, they’ll get updates and will be able to view their student’s portfolio. If you’re a Showbie Pro teacher, you can also give parents complete access to assignments in any classes you choose. Student portfolios are now part of both Showbie Basic and Showbie Pro! You and your students can instantly tag any document, comment, or grade from any assignment to be included in a personal portfolio. It’s a great way to collect examples of your students’ best work, and show evidence of their progress over time. Next parent-teacher night will be a breeze. Improved file caching. Files you view in Showbie will now be cached on your device, as long as there’s free space available. This means less time spent waiting for downloads to complete, making your assignment workflow even more efficient. Student portfolios are now part of Showbie Pro! You and your students can instantly tag any document, comment, or grade from any assignment to be included in a personal portfolio. It’s a great way to collect examples of your students’ best work, and show evidence of their progress over time. Next parent-teacher night will be a breeze. We’ve added the ability to copy classes. This means you can take a class from last year, complete with all assignments and shared materials, and easily reuse it with your new students this year! The copy class feature is included in both Showbie Basic and Showbie Pro. You can now create assignments without a due date. Great for long-term projects or ongoing tasks, or if you just want to let your students know what a cool and easygoing teacher you are. The Showbie Gradebook is here! Teachers using Showbie Pro can now add grades while viewing student work. Grade entry is super fast and flexible â�� you can add anything from 10/10, 100%, A+, or even your favorite emoji! When you’re done you can review grades at a glance, and if you need to, export your grades to another system. A big upgrade to the pen tool! Now you can use two fingers to pan and zoom around a document while the pen tool is selected. We’ve also upgraded the pen to create smoother, more natural lines for better quality writing and drawing. Student Search! Teachers can now see and search a list of all students across all of their classes. Pick a student from this list and get a summary of that student’s classes, assignments, and grades all in one place. We’ve added an â��All Assignments’ view for students and teachers, allowing students and teachers to see upcoming tasks and due dates across all of their classes. The Showbie website is now available in 12 languages, just like the iOS app. Miscellaneous bug fixes and improvements, as usual! We’ve added a new way for you to try out Showbie Pro! Invite your fellow teachers to try Showbie, and when one of them signs up, we’ll upgrade both of you to Showbie Pro for 2 weeks! Pinned Voice Notes (Pro Feature). Now you can pin a voice note to any page of a PDF or image, making verbal feedback easier than ever! You may now PERMANENTLY delete archived classes and assignments if you like. Don’t say we didn’t warn you! Teachers and students can now customize their notification settings from within the iOS app. We added an easier way to remove yourself from a class if you’re a co-teacher. As well, students can now elect to remove themselves from a class in the iOS app. You can now read super-super-long pinned text notes in their entirety. The display of notes imported from other PDF editors is also improved. About a billion other small fixes and improvements! Showbie is now available on iPhone and iPod touch! Take your class with you everywhere, on any iOS device. Who needs Wifi? We love our international teachers and students! Showbie is now available in Spanish, Swedish, Danish, Dutch, Finnish, Arabic, French, Norwegian, Traditional Chinese, Simplified Chinese, and Japanese! Showbie’s Assignment Copy feature is now available for both Free and Pro teachers! Pen color and thickness settings are now persistent when switching between documents. Dozens of bug fixes and small improvements. Showbie’s new Quick Marking feature allows teachers to review and provide feedback on student submissions faster than ever before! Available in both free and pro editions of Showbie. Showbie Pro teachers and students can now type directly on their documents with our new text tool. You get full control over the position, alignment, color, and size of your text as well. We’ve added the iOS8 document picker to Showbie, making it even easier to grab documents from cloud providers like iCloud, Dropbox and Google Drive. We’ve improved VoiceOver support, making Showbie more accessible for visually impaired teachers and students. Lots of small improvements and bug fixes! Showbie now provides an iOS8 Share Extension, making it even easier to save files, links and comments from other apps! You can now preview ePub files right inside Showbie. Great news for Book Creator fans! Fixed bugs and improved stability of the Showbie document viewer. We’ve made the Showbie pen tool permanently available for all Showbie customers! Showbie Pro teachers and students can now record voice notes up to 30 minutes and videos up to 10 minutes! Showbie Pro teachers and students can now change the color and line thickness of the pen tool! Showbie Pro teachers and students can now show and hide annotation layers! Sign up or sign into Showbie with your Google credentials so you don’t need to memorize another password. Now you can always see what’s new in your classes and assignments. When you notice a blue arrow or stripe next to a class, assignment, or student, it means something has been added or changed since the last time you checked. Accessing Class Settings and Assignment Settings is now more straightforward. Adding content to your assignment folders is easier. You can now add Showbie annotations to any image or PDF file in your assignment folder, instead of just PDFs. When recording a voice note, you now get a better indicator of your audio signal. You can now listen to Voice Notes right in the assignment folder list, and â��scrub’ backward and forward during playback. Flip between landscape and portrait mode for the optimal view. Thumbnails of uploaded images and PDF files including annotations so you can instantly see a preview. A late submission indicator shows next to a folder to show if work has been added to the folder after the due date. For Pro users, the maximum length of video recorded in Showbie has been increased to 5 minutes! Assignment duplication (Pro feature). Any assignment can be copied to multiple classes in a few taps! Assignment locking (Pro feature). Showbie Pro includes the ability to lock assignments, so you can grade work in batches and prep assignments in advance! Rename files in Showbie! Swipe your finger over a file and tap the name to edit it. Copy and paste text comments! Tap and hold on a comment then tap ‘copy’. You can paste the text wherever you want, including a new text note in another folder. Pin text notes right inside PDF files! This feature is available to Showbie Pro or Pro trial users. Use the text note tool when viewing a PDF to attach a quick note to any spot on any page. You can expand, collapse, reposition and delete notes as well. Teachers can add shared notes or individual feedback, just like assignment folder notes. Export your student list! Go to the class members popover and tap ‘Copy Students’. You can paste the CSV student list into a spreadsheet or anywhere you like. We’ve improved compatibility with iOS7, including a bright and clean new app icon.